VIDEO | Maradona: "In My Heart, I'm Palestinian." Palestinian Authority President Mahmoud Abbas, who was in Moscow for the World Cup 2018 final, met with former Argentine soccer star Diego Maradona who expressed his solidarity with the Palestinian people. In a short conversation, Maradona reportedly said to Abbas that he sympathizes with the plight of the Palestinian people, as the two embraced each other in a brief hug. Maradona wrote on his Instagram account. 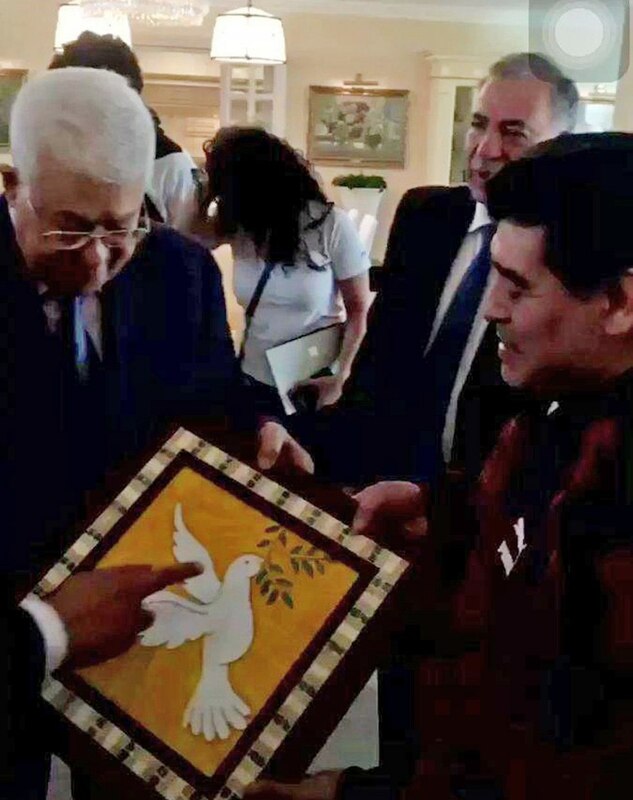 Mahmoud Abbas, for his part, complimented Maradona and presented him with a gift in honor of the meeting—a painting of a dove carrying an olive branch and olive oil. At the end of last month, Maradona was dismissed from his position as FIFA ambassador to the World Cup following his unruly behavior in the stands during the Argentina matches. He gave the finger to the Nigerian fans after Argentina’s dramatic victory in a third game of the group stages, before collapsing and being taken to the hospital.